The snow covered hills of Whistler Blackcomb in British Columbia is a great place to rest after a long hiking journey. Hiking around the Whistler Blackcomb region is one of the most exhilarating outdoor activities enjoyed by many tourists that visit these snow covered apexes of British Columbia. A hiker enjoys the spectacular scenic views of Whistler Blackcomb and finds the hiking adventure well worth the trip. 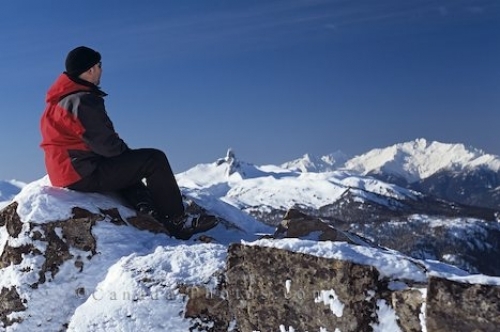 Hiker overlooking Mountain Range, Whistler Mountain, winter, Whistler, British Columbia, Canada, North America. Model Released. Picture of a successful hiking expedition at the peaks of the Whistler Blackcomb mountain range in Canada, BC.